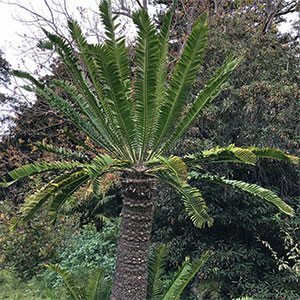 Commonly known as the Bread Tree, Encephalartos altensteinii is a species from souther Africa. One of the easier cycads to grow it will grow in tropical areas right through to the cooler temperate climate zones. Looking more like a palm tree than a cycad, this is a plant that actually forms a clump over time. It sends out suckers from the base, however in cultivation looks best as a solitary plant. Grown in containers or in the ground this is a great plant to add structure and a tropical look to your landscaping design. Being adaptable in climate requirements this is a cycad that will grow well in full sun to part shade. Growth rate is medium and in a well drained humus rich soil it requires very little care once established. Over time it can reach 5 – 7 metres in height and forms a sturdy trunk. In dry climates, extra water over summer will keep the plant looking green and healthy. The old foliage can be pruned away to give the plant a clean trunk if required. Position – Full sun to a part shade. Spread – Forms a crown to around 2m plus.